Our hostel is 136 beds and is proud to be a part of Bear Hostels international chain of hostels. You want prime location? Check. We're in New Arbat, possibly THE most happening area of Moscow - a neighborhood filled with arty cafs, bars and one-off shops selling tons of interesting stuff. You want comfort and facilities? Check. Choose from 2, 4, 6, 8, 10, 12,16 bed dorms, all with free Wi-Fi and plenty of space. . .
You want more? OK, well there's our stunning spacey lobby with plasma TV's, Sony Playstation and a fully equipped kitchen, our mini-store offers you to buy drinks, snacks, hot food, hygienic stuff. You want local amenities? Check. The Old Arbat Street with its unique atmosphere of fun and party with plenty of night clubs, bars, cafe's, 24/7 restaurants and cafeterias is less than five minutes' walk away, as is the Red Square and Kremlin, how about some interesting sightseeing?. Oh, and Moscow's largest and famous European shopping mall (biggest in Russia) is couple of subway stations away. You want advice? Check. Our drop-dead gorgeous, international, multi-lingual staff is on hand 24 hours a day to help with info, maps, tips, trips and sips Just ask - we're easy to get along with. You want to find us easily? Check. We're at a huge transport hub, with Subway (metro) stops less than five minutes from the front door. 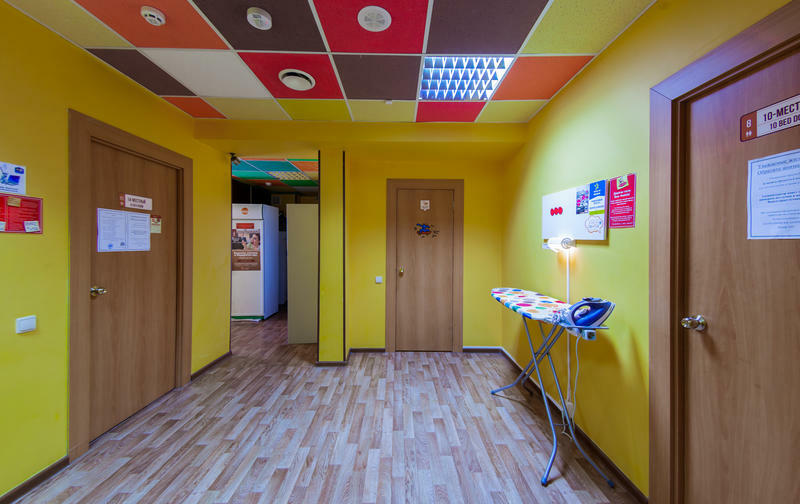 Please note: There are more Bear Hostels available in Moscow (Bear Hostels on Smolenskaya, Bear Hostels on Mayakovskaya) and Sevastopol, Ukraine. We are right in the center of Moscow. Once you exit you will find yourself at the massive street called New Arbat (4 lines each way), it will be to your right, so please go straight (the big street will stay to your right) cross little street and walk till you see the underground crossing, and once you do please enter it. You will be crossing the big street under the ground and once you do cross it, turn left and keep walking straight till you see a 4-5 floored building with a green tower and few banks in there, this building is New Arbat house # 20, if you are in front of it, than take a little left and enter an arch you will see in this building. Please turn left after you walk through the arch. If you turn left and walk about 30 meters you will see Bear Hostels logo and a door bell, please ring it and wait till the security guards will let you in. (RUS: Здравствуйте, к вам обращается администрация гостиницы Беар Хостелс, наш Клиент видимо потерялся и пытается понять как найти нас, можем ли мы попросить вас подсказать ему дорогу до улицы Большая Молчановка 23, строение 2, это возле Нового Арбата дом 20.